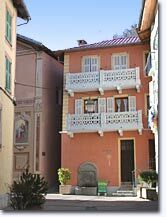 The departement of the Alpes Maritimes - Pop. : 550 et 200 h.
97 km North of Nice take the RN 202 for 38 km then right on the D2205. 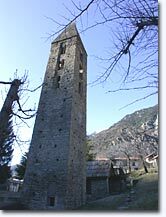 Isola Village is a medieval village located at the convergence of the river Tinee and the stream of Castiglione, which comes down from the valley of Chastillon. An authentic mountain village with astonishing riches to share. The tourist office organises free guided tours. You will discover the bell tower of St Pierre, standing like a sentinel at the entrance to the village, a magnificent square 12th century edifice and the only surviving remains of the ancient church of St Pierre. If you like trompe-l'oeil painting, you'll be in seventh heaven, dazzled by the numerous facades painted in soft blue, pink and yellow tints. Starting with the baroque church of St Pierre es Liens, (17th century). 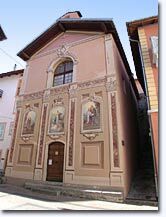 Take the main street, beautifully cobbled, to admire the incredible chapel of St Anne (1465). Its facade is completely covered with painted murals, and the ceilings are also painted with Sienna. 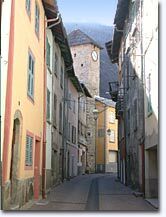 In this smart and superbly restored village you will no doubt be greeted by some of the old timers, serenely watching time go by ! 17 km from Isola Village and an hour and a half from the beaches of the Mediterranean. Altitude from 2000 m to 2938 m (Station) at the Malinvern, in the Mercantour National Park. With its Mediterranean sunshine and exceptional snow cover, the resort of Isola 2000 built in the early seventies has become a paradise for the "switched on" winter sports crowd: skiing, snow-boarding and free ride! A skiing area of 120 km, 45 runs for every level, 22 ski lifts, 160 snow cannons, 1 snow park (with half-pipe). Skiing and Snowboarding School (110 instructors). Heliski, driving on ice, ice rink, walks, snow scooters, snow shoes, heated swimming pool (Isola Village), AquavallÃ©e (Isola Village). Chapels of St Roch (16th century) and St Anne (15th century). Municipal oven converted into an Eco-museum (permanent exhibition of old objects). 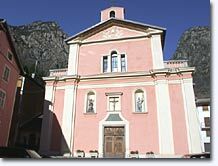 Above Isola 2000, don't miss the nature centre, the byre, the sanctuary of St Anne (12th century) and the thermal baths of Vinadio. Childrens' clubs for 6 - 12 years old. 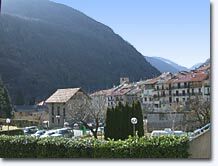 Saint Sauveur sur Tinée (13km), Saint Etienne de Tinée (15km).